You can use this website to get information about how to visit our facility to view our exhibitions and conduct research, find out about our programs, or take a look at our calendar. You may also want to learn about our collections and their locations on the UC Berkeley Campus, search our online database, or visit us online with our digital programs. You can always contact us by phone, email, and on the web. Please make sure to click the button below and stay in touch via Facebook and other social media. The annual exhibition schedule follows UC Berkeley's Academic Calendar, with openings in the Fall and Spring semesters of each year. Weekly gallery opening hours are Tuesday-Friday, 11AM-4PM. The galleries remain closed to the public during Winter and Summer breaks. 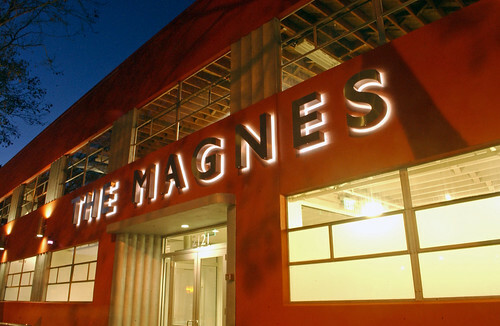 During these times, The Magnes is open to researchers on Tuesday, Wednesday, and Thursday each week, by appointment. For more information about opening days and events, check our calendar. For further information about collection access, refer to the Collection Services Page. Follow us and Like! The Magnes on Facebook!